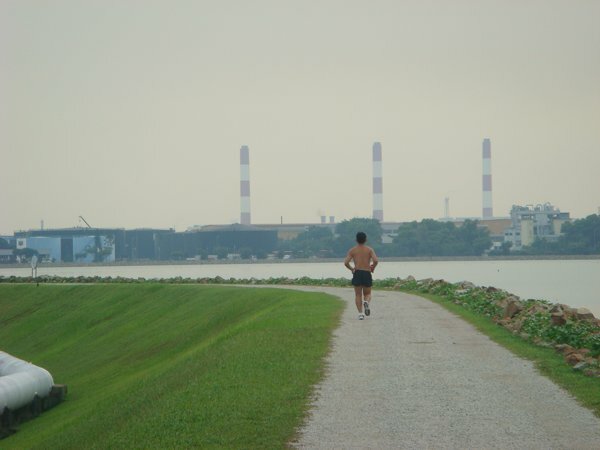 The Ulu Pandan reservoir at the West Coast of Singapore is a quiet place for some long distance run training. The reservoir is separated only by a narrow seawall from the sea and the neighboring industrial harbour facilities. 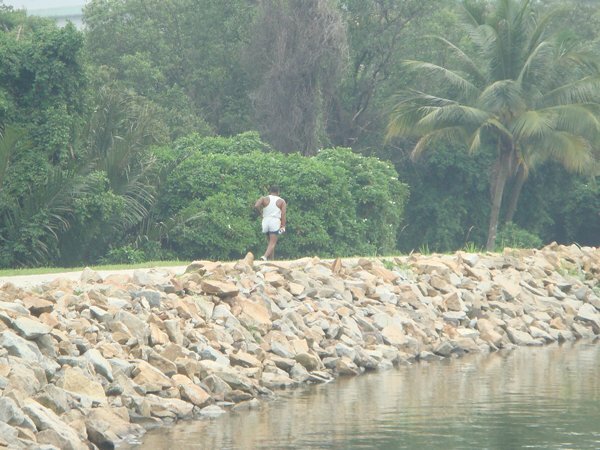 In the morning totally deserted, you may only meet some lonely runners, monitor lizards on the way to their breakfast and some turtles. If you come early enough you can see a beautiful sunrise, coloring the undisturbed water of the reservoir. By public transport: There is no MRT station nearby - this is West Coast! 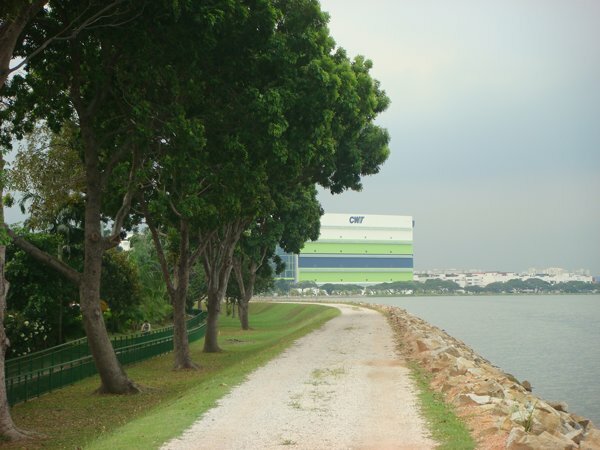 The nearest still might be Clementi or Jurong East. The best is to catch a bus, the 176 stops directly on West Coast Road, at the reservoir entrance. View Larger Map By car: Search for the free parking lot just at the entrance, at Butik Batok East Ave 2. The track: It’s a totally flat track with a total length of something above 6km. There are distance markers every 500m. A portion runs along West Coast Road, then leading away towards the sea; and looping back to the residential area and the starting point. The way is laid out of small gravel, small enough for convenient running. Water point: No water point or whatsoever facilities nearby. 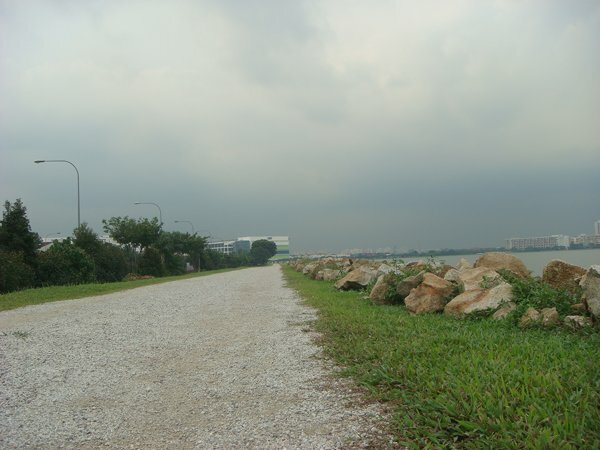 The closest is in West Coast Park which is only a stonethrow away. 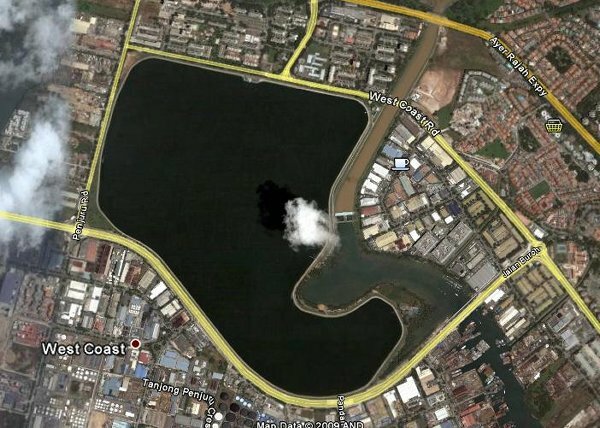 Google Maps: Ulu Pandan Reservoir on Google Maps.